Volkswagen is always looking for new ways to make production faster and more efficient. The line-runner is a new idea that has been tested on production lines at VWs Wolfsburg plant, where workers routinely need new parts to be brought to the assembly line, a task normally handled by mini-trucks. But now VW has turned to the US company Segway to add a special carrying cage to its two-wheel standup electric transportation device. 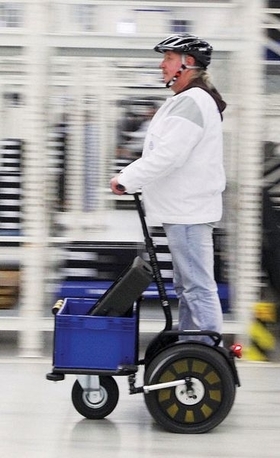 Three specially adapted Segways can carry up to 25 kilos of parts along the 500 meter assembly line or to nearby halls. The zero-emission Segways could replace the mini-trucks because they deliver parts much more quickly and efficiently according to Pierre Pommer, line runner project manager and the originator of the idea. The line runners have a range of 25 kilometers between re-charges and -- adding to their appeal -- they also look like great fun!